These 3 little pieces are winging their way down to a beautiful new gallery and retail space on Oxford Street in Sydney called Pablo Fanque. They’re part of an exhibition called WHITE. A couple of years ago I was lucky enough to be invited to do a residency at the University of Massachussetts. I spent two (very cold) weeks working from a lovely studio space in the Star Store, New Bedford, hanging out with some old friends and making some new ones. 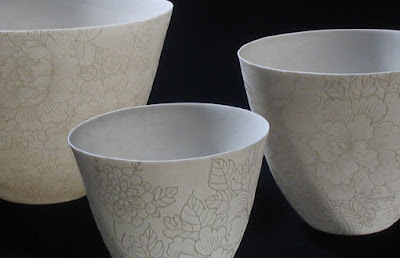 While I was there I met Katie Parker, who makes really beautiful work that you can see here. Katie and I were both working with decals and she very very generously gave me the white decals that I ended up using on these pieces. I'd been wanting to play around with some white on white, but sourcing white decals at home had proven very difficult. Having them custom made had proven even more difficult, and outrageously expensive. But thanks to the generosity of that nice girl from Columbus, this little series will be glowing away at Pablo Fanque from December 11 until mid- January 2008. Other artists included are: Anna Davern (who graced Brisvegas with her presence last week! ), Elfrun Lach, Nina Oikawa, Emma Davies, Lisa Cahil, Pennie Jagiello, Melanie Katsalidis, Lucy Folk, Jane Bowring, Alice Whish (isn’t that a lovely name! ), Joanna Levinson and more…. Mel - you are so sweet - thank you! These pieces are beautiful - if you want more white decals, check out www.instardecals.com and in the keyword search type in white, and there are several floral patterns for sale. oooh you're a good girl Katie Parker!! I'll check it out immediately! Thanks! Again! !